Bi-Centennial Edition, History of the Commonwealth of Pennsylvania, Civil, Political, and Military, From It's Earliest Settlement To The Present Time, Including Historical Descriptions of Each County In The State, Their Towns, And Industrial Resources by William H. Egle, M.D., M.A., Member of the Historical Society of Pennsylvania, Third Edition, Revised and Corrected, Published in Philadelphia by E. M. Gardner, 1883. All spelling and punctuation as written by J. Africa Simpson. The entire valley of Juniata was included in the county of Cumberland. From this county Bedford was formed in 1771. 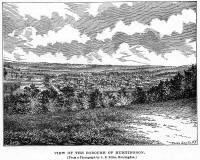 Huntingdon was erected from Bedford by an act of Assembly, passed on the 20th day of September 1787. By this act, Benjamin Elliott, Thomas Duncan Smith, Ludwig Sell, George Ashman, and William McElevy, were appointed trustees, who, or any three of whom, were directed to take assurances of ground in the town of Huntingdon for the site of a court house and jail. By an act passed on the 2d day of April, 1790, Andrew Henderson and Richard Smith were added to fill vacancies that occurred by the death of one and the removal from the county of another of the original trustees. bria counties, March 26, 1804; Blair county, February 26, 1846, and by the annexation of a small corner to Mifflin county. This county lies wholly within the central mountainous region, consequently its surface is very much broken. On the south side of the Juniata there occur, in passing from the east toward the west, ranged in almost parallel lines, Tuscarora, Shade, Black Log, Jack's, Sideling Hill, Terrace, and Tussey's mountains; and on the north side, Jack's, Standing Stone, Broad, Bare Meadow, Greenlee, Tussey's, and Canoe mountains. Intervening between these mountains are numerous ridges of less elevation, called: Pine, Sandy, Saddle Back, Blue, Owen's, Chestnut, Rocky, Clear, Allegrippus, Piney, Warrior's, Shaver's Creek, Bald-Eagle, and many others of minor importance. Broad Top mountain is situated at the southern line of the county, between Sideling Hill and Terrace mountains. Its broad summits tower above the adjacent mountains. The existence of semi-bituminous coal in this mountain was known a hundred years ago. Mines were opened for the supply of blacksmiths and others, and the products hauled in wagons to Huntingdon, Bedford, Chambersburg, and other towns, and carried from Riddlesburg in arks to towns along the Juniata and Susquehanna. Two railroads, the Huntingdon and Broad Top, and the East Broad Top, are now employed in the transportation of the coal. The entire county is drained by the Juniata. Its chief tributaries are: Raystown branch, Little Juniata river, and Tuscarora, Aughwick, Hare's, Mill, Standing Stone, Vineyard, and Shaver's creeks. Other branches of these steams are called: Black Log, Shade, Little Aughwick, Sideling Hill, Three Springs, Trough, James, Shy Beaver, Sadler's and Spruce creeks. These streams afford numerous and valuable water-powers, many of which are utilized in driving manufactories of various kinds. Between the mountains are a corresponding number of valleys of every variety of shape and soil. Some of these contain as fertile land as is found in the State. The rich soil of the river flats and the valleys attracted the settler, and long before the final expulsion of the hostile Indians flourishing settlements of industrious farmers dotted the territory of the county. Of the 575,360 acres of land estimated to be included within its boundaries, not more than one-third are under cultivation. By the census of 1870, the farms were valued at 9,445,678 dollars. localities. From Woodcock valley large quantities of ore have been carried by rail to Danville, Johnstown, and other points. The abundance, variety, and value of the ores, the rich and convenient deposits of limestone, contiguity of the Broad Top, Allegheny, and Cumberland coal fields, and facilities for transportation by rail and canal, combine to indicate that by the judicious employment of the necessary capital this county can take a more advanced place in the future than it has ever done in the past in the manufacture of iron. The experience of the Kemble iron company's furnaces at Riddlesburg, on the Huntingdon and Broad Top railroad, and those of the Rockhill coal and iron company at Orbisonia, on the East Broad Top railroad, all run on Broad Top coke, has demonstrated its economy and value in the smelting of iron ores. Several quarries of "Meridian" sandstone are being working in the vicinity of Mapleton. The sand rock is crushed and pulverized in mills or crushers erected for that purpose, and is transported in large quantities to the glass works of Pittsburg and other cities. Mines that give promise of excellent ochre and umber are being opened in the vicinity of Mapleton. It is to be regretted that an accurate census of the manufacturing establishments has never been taken. There are in the county furnaces, forges, rolling mills, foundries, car, and industrial works, water and steam flouring and sawmills, water and steam sand-crushers, tanneries, furniture, chair, carriage, broom, shoe, and woolen manufactures, planing mills and numerous other industrial establishments. The first highways were Indian paths which traversed the county in many directions. Along these the traders and pioneers found their way. They were only bridle paths, and did not admit the passage of a wheeled conveyance. After farms were opened and mills built, necessity prompted the opening of a wagon road along the Juniata. This was followed by the cutting of roads in other directions from "Standing Stone". The river was used for floating arks and keel-boats, laden with the products of the county, to various point as far south-eastward as Baltimore. A turnpike was constructed from Lewistown to Huntingdon about 1817, and was extended by the Huntingdon, Cambria, and Indiana company to Blairsville, a distance of seventy-seven miles, soon thereafter. The Pennsylvania canal extended though the county from Shaver's Aqueduct below Mount Union to the line of Blair county above Water Street. This improvement was completed to the borough of Huntingdon in November, 1830. It is now abandoned above the Huntingdon dam. The line of the Pennsylvania railroad enters the county below Mount Union and following the Juniata and Little Juniata, finally leaves the county between Birmingham and Tyrone. On the 6th day of June, 1850, the road was completed to Huntingdon. The opening to Pittsburg of this great highway of travel and traffic marked an important era in the history of the Commonwealth, and has materially increased and facilitated the development of the resources of the valley of the Juniata. Maryland line, and connecting there with roads entering the Cumberland coal region. Over four million dollars were expended in the construction and equipment of the Huntingdon and Broad Top railroad. The length of the main line is forty-five miles, and of the branches fourteen miles. During the last fiscal year it carried over three hundred and eighty thousand tons of bituminous coal and forty-six thousand tons of iron ore. The East Broad Top railroad (three feet gauge) extends from Mount Union to Robertsdale in the Broad Top region, a distance of thirty miles, and cost about one million dollars. It was opened in 1873, and during the last fiscal year carried sixty-three thousand tons of coal. The earliest permanent settlement effected within the limits of the county was at the Standing Stone (now Huntingdon). The compiler was informed some years ago by one of the old citizens that the Indians living at Standing Stone had cleared land and cultivated corn. In 1754, Hugh Crawford was in possession of the land, and continued to hold it until the first day of June, 1760, when he conveyed the tract, containing four hundred acres, to George Croghan, who on the 10th day of December 1764, obtained a warrant from the Proprietaries, authorizing a survey and return thereof to the land office. In 1754 Peter Shaver commenced a settlement at the mouth of Shaver's creek. In 1760 or 1761, James Dickey commenced an improvement on the south-east side of Shaver's creek, near Fairfield. Other improvements were made along Shaver's creek, and on the upper branches of Standing Stone creek, as early as 1762. The bottom lands along the Juniata, the Raystown branch, and the Aughwick creek, and the fertile lands of Tuscarora, Black Log, Germany, Kishicoquillas, Plant Cabin, Woodcock, Hart's Log, Canoe, Spruce Creek, and Warriors' Mark valleys, were dotted with improvements in 1761-2. In 1748 Conrad Weiser was sent on a mission from the Provincial government to the Indians at Ohio. His route was thorough this county, and in the journal of his trip, the Black Log sleeping- place, the Standing Stone, and other points are mentioned. John Harris, the founder of Harrisburg, in an account of the road from his ferry to Logstown on the Allegheny, taken in 1754, mentions localities on his route, now in this county, as follows: Cove Spring, Shadow of Death, Black Log, Three Springs, Sideling Hill gap, Aughwick, Jack Armstrong's narrows, Standing Stone, and Water Street. The Cove Spring is supposed to be what is now known as the Trough Spring in Tell township; the Shadow of Death was applied to the water gap in the Shade mountain, now called Shade Gap; the Black Log was near Orbisonia; the Three Springs are in the vicinity of the borough of that name; Aughwick was on the site of Shirleysburg; Jack Armstrong's narrows, now curtailed to Jack's narrows, designates the narrow passage cut by the Juniata through Jack's mountain above Mount Union; and the Water Street to a gorge between the mountains, through which the waters of the Juniata pass, above the village bearing that name. by the Indians, a branch of the Six Nations, and was covered by their hieroglyphics. The natives, who seem to have regarded this stone with great veneration, after the treaty of 1754, by which their title to the lands of the valley of the Juniata was relinquished to the Proprietary government, migrated, and as it is generally supposed, carried the stone with them. Another stone, erected soon after by the white settlers, was covered with the names of traders, residents, and colonial officials. It was broken by a carelessly thrown "long bullet". A part of it, bearing numerous interesting inscriptions, is in the possession of Mr. E. C. Summers. Although Dr. Smith, after laying out the town in 1767, changed the name to Huntingdon, the old appellation, "Standing Stone", continued for many years thereafter to be used by the residents of the valley. That name is still borne by the creek, valley, ridge, and mountain in the vicinity, and its Indian equivalent, "Oneida", has been applied to a township through which the creek flows. The seal of the borough has as its central figure a representation of the stone. Soon after the treaty of the 6th of July, 1754, settlers commenced improvements in choice spots throughout the present county, and early in the next year a number of warrants were granted by the land office, authorizing the survey and appropriation of tracts applied for. The Indian troubles following the defeat of Braddock prevented the making of any official surveys in pursuance of these warrants earlier than 1762. Three Proprietary manor, Shaver's Creek, Woodcock Valley, and Hart's Log, and a part of Sinking Valley are included in this county. Peter Van Devander, 1775; David Eaton, 1775; Joseph Pridmore, 1781; Caleb Armitage. Henderson township - John Fee, 1775; John Dorland; Joseph Nearon, 1781; Daniel Evans, 1778; Benjamin Drake, 1785. Huntingdon - Hugh Brady, 1766; Michael Cryder, 1772; Benjamin Elliott, Adam Bardmess, Abraham Haines, 1776; David McMurtie, 1777; John, Matthew, and Robert Simpson, 1789; Alexander McConnell, 1786; Rev. John Johnston, 1790; Michael Africa, 1791; John Cadwallader, Andrew Henderson, Peter Swoope, Frederick Ashbaugh, Ludwick Sells. West Township - Peter Shaver, 1754; Hugh Means, 1773; George Jackson, 1772; Thomas Weston, 1772; Henry Neff, 1780; Alexander McCormick, 1776; Nicholas Graffius, 1778; Patrick Maguire, James Dearment, 1779; Samuel Anderson, James Dickey, 1760 or 1761. Jackson township - William McAlevy, 1767; ___ O'Burn. Barree township - Gilbert Chaney, 1786; George Green; Richard Sinkey, David Watt, Matthew Miller, John Forest, William Hirst, Chain Ricketts. Oneida township - William Murray, Nathaniel Gorsuch, 1787. Hart's Log valley - David and Charles Caldwell, 1767; John Mitchell, 1774; Peter Graffius, 1778; John Canan, John Spencer, 1779; Moses Donaldson, Jacob and Josiah Minor. Woodcock valley - Henry Lloyd, Joshua Lewis, George Reynolds, 1774; Nathaniel Garrard, 1776; James Gibson, 1781; Solomon Sell, 1785; ___ Elder; ___ Hartsock. Morris township - John Bell, Edward Beatty, 1779. Franklin township - Benjamin Webster, Absolem Gray, 1779; Alexander Ewing, 1786; Abraham Sells, 1785; James Hunter, 1784. Warrior's Mark township - Thomas Ricketts. The following list contains the names of the owners, location, and date of erection, as nearly as can be ascertained, of the early grist-mills of the county. Robert Cluggage's, Black Log creek, Cromwell township, before 1773; Bartholomew Davis', Shirley township, before 1774; Michael Cryder's, Juniata river, Walker township, about 1773; Abraham Sell's, Little Juniata, Franklin township, about 1776; Sebastian Shoup's, Shoup's run, Hopewell township, 1787; Huntingdon, Juniata river, Huntingdon borough, about 1793; N. Garrard's Vineyard creek, Walker township; William McAlevy's, Standing Stone creek, Jackson township; Joseph Pridmore's, Mill creek, Brady township; McCormick's, Shaver's creek, West township; Little's, Laurel run, Jackson township; Minor's, Little Juniata, Porter township; Crum's, Trough creek, Tod township. At least two of the companies sent from Bedford county for the defense of the colonies during the war for Independence were composed of men who lived within the present limits of Huntingdon county. One of these, attached to the first battalion, was commanded by Captain William McAlevy, afterward known as Colonel, and General McAlevy, and was in the service in January, 1777. After faithful service in the defense of American liberty, Captain McAlevy returned to his home in Standing Stone valley, where for many years he was an active and influential citizen, and until his death enjoyed the universal respect of his neighbors. His name is perpetuated in that of the village called McAlevy's Fort, located upon the tract of land where he resided. Thomas Holliday was ensign of his company. Company of rangers organized in 1779. This company among other duties was engaged in defending the settlements on the Juniata. In October, 1779, when Captain Cluggage occupied Fort Roberdeau, in Sinking valley, he reported that his company had been reviewed and passed muster with three officers and forty-three rank and file; one of the latter "killed or taken". A company, commanded by Captain Cluggage, was in the Continental service in New Jersey in 1776-7, and formed a part of the battalion under Colonel John Piper. In 1781, Dublin, Shirley, Barree, Hopewell, Frankstown, and Huntingdon townships, then embracing the whole of the counties of Huntingdon and Blair, composed one of the battalions of Bedford county. STANDING STONE, east of Third and south of Washington street, in the borough of Huntingdon. It was built of stockades, and it included dwellings and magazines. A blacksmith shop that stood at No. 205 Penn street, was constructed of oak logs from the fort, probably a part of a magazine. In 1778 the inhabitants were much alarmed at a threatened assault by a band of Tories and Indians, variously estimated at from three hundred to one thousand in number. General Roberdeau wrote from Standing stone, under date of April 23d, 1778, confirming the reports of the alarm of the inhabitants, and recommended that the militia be called out and sent forward to meet the enemy. In July, Colonel Brodhead's regiment, then on a march from the east to Pittsburg, was directed to stop here, and three hundred militia from Cumberland, and two hundred from York county, were ordered to join them. On the 8th of August, the council informed Dr. William Shippen, director-general, that there was a body of five hundred men at Standing Stone that would require a supply of medicine. ANDERSON'S was near the mouth of Shaver's creek, and near the borough of Petersburg. McALEVY'S, on Standing Stone creek, in Jackson township, seventeen miles north-east of Huntingdon. HARTSOCK'S in Woodcock valley, between McConnellstown and Marklesburg. SHIRLEY was one of the cordon of Provincial defenses erected during the French and Indian troubles that followed the defeat of General Braddock. It was built about 1755, on the bluff at the northern end of the borough of Shirleysburg, on or near the site of the Indian town of Aughwick, often mentioned in colonial annals. In the autumn of 1756, the royal forces evacuated the fort, and it does not appear to have been afterward used for defensive purposes. The 7th day of September following, under Robert Allison, captain, and Jacob Miller, first lieutenant, they marched to Niagara. On the 2d of October, they arrived at Buffalo. Other companies from Huntingdon county were commanded by Captains Moses Canan, William Morris, and Isaac VanDevander. Dr. Alexander Dean, of the borough of Huntingdon, was chosen surgeon of the Second Pennsylvania regiment. When the war with Mexico was declared, a number of patriotic citizens, probably equal in number to a full company, separately volunteered their services and were attached to different companies formed in neighboring counties. They, without exception, behaved gallantly; and most of them, after having participated in many battles of the war, returned home at the close of the contest. The avidity shown by the sons of "old Huntingdon", in rallying to the support of their county in the rebellion of 1861, exhibited a patriotism not less commendable than that of the sires of '76. On the 13th or 14th of April, 1861, one or two days after the telegraph had flashed the intelligence throughout the Commonwealth that "war had commenced", the Standing Stone Guards, of the borough of Huntingdon, tendered their services to Governor Curtin. Official notification of their acceptance was received by the company on the 19th, and on the 20th, Saturday, numbering over ninety men, proceeded to Harrisburg, and after discharging all but seventy-seven, were mustered in as Company D of the 5th Regiment Pennsylvania volunteers. The company was officered as follows: Benjamin F. Miller, captain; George F. McCabe, first lieutenant; James D. Campbell, second lieutenant. The field officers of the regiment were: R. P. McDowell, of Pittsburg, colonel; Benjamin C. Christ, of Schuylkill county, lieutenant-colonel; R. Bruce Petriken of Huntingdon, major. successively by Captains George W. Patterson, James Bell, Thomas S. McCahan, and D. A. Shelp; mustered out, July 18, 1865. 110th Regiment - Isaac Rodgers, promoted from captain, Company B, to major, December 21, 1862; to lieutenant-colonel, December 5, 1863; wounded at Spottsylvania, and died May 28, 1864; Company B, commanded successively by Captains Seth Benner, Isaac Rodgers, and John M. Shelly; and Company D, by Captains Samuel L. Huyett and John B. Fite; mustered out June 28, 1865. 125th Regiment, John J. Lawrence, major - Company C, Captain William W. Wallace; Company F, Captain William H. Simpson; Company H, Captain Henry H. Gregg; Company I, Captain William H. Thomas. 149th Regiment, George W. Speer, major - Company I, commanded successively by Captains George W. Speer, promoted to major; Brice X. Blair, lost an arm at Gettysburg, July 1, 1863; Samuel Diffenderfer, discharged May 4, 1864; David R. P. Neely, who was mustered out with the company, June 24, 1865. 185th Regiment, 22d cavalry - Company A, commanded by Captain John D. Fee, nine months' service; Company K, commanded by Captain John H. Boring, three years' service. 192d Regiment, one years service, William F. Johnston, major - Company B, commanded by Captain Thomas S. Johnston. 195th Regiment, one hundred days' service - John A. Willoughby, quartermaster, Company F. 202d Regiment, one years' service - Company K, commanded by Captain A. Wilson Decker. 205th Regiment, one years' service - Company D, commanded by Captain Thomas B. Reed. 3rd Regiment, militia of 1862 - William Dorris, Jr., colonel; Company F, commanded by Captain George W. Garrettson. 12th Regiment, Henry S. Wharton major - company D, commanded by Captain Edward A. Green; Company I, commanded by Captain George C. Bucher. Rev. George W. Eaton was born in Brady township, July 3, 1804, and died at Hamilton, New York, August 3, 1872. He graduated at Union College in 1829; was a professor of ancient languages in Georgetown College, Kentucky, from 1831 to 1833. Became connected in 1833 with Hamilton Theological Institute, incorporated in 1846 as Madison University, and was successively professor of mathematics and natural philosophy, of civil and ecclesiastical history and of theology. Was president of the college from 1856 to 1868, and president of the theological seminary from 1861 to 1871. John Canan settled in Harts Log valley during the Revolutionary war. On the 3d February, 1781, he was commissioned as one of the justices of Bedford county. In 1787 he was one of the members of the Assembly for that county at the time of the separation of Huntingdon county. The same year he was appointed deputy surveyor for the county of Huntingdon, and held that office until 1809. Joseph Saxton, born in the borough of Huntingdon, March 22, 1799; died at Washington, D.C., October 26, 1873. He learned, in youth, the trade of watch-making. He was the inventor of numerous mechanical machines, and was widely known and highly esteemed for his scientific acquirements. In 1843 he became a resident of Washington, and was employed in the Coast Survey office, where he designed and superintended the construction of the apparatus used in that department. He remained in the service of the government until his death. Rev. John Johnston, born at or near the city of Belfast, Ireland, 1750; died at Huntingdon, December, 1823. In November, 1787, he was installed as pastor of the Hart's Log and Shaver's creek Presbyterian congregations. In 1798, his pastoral relation to the Shaver's Creek congregation was dissolved, and in 1790 he accepted a call from the Huntingdon congregation for one-half of his time. From this date until the year of his death - a period of thirty-three years - he continued as pastor of the two congregations. Hugh Brady, a brigadier-general in the United States army, was born at Huntingdon, in 1768. He entered the service in 1792 as lieutenant; served under Wayne in his campaign against the Western Indians, and in the war of 1812, was distinguished for his gallantry and bravery. The township of Brady was named in honor of the general. ALEXANDRIA is situated on the north bank of the Juniata, seven miles north-west of Huntingdon. It is surrounded by the fertile and well cultivated lands of the valley of Hart's Log, a name derived from a log hollowed out and used by John Hart, an Indian trader, in feeding his pack-horses. It was laid out in 1798, incorporated as a borough April 11, 1827. It contains three churches and three public schools. BIRMINGHAM, on the north bank of the Little Juniata, on the opposite side from the Pennsylvania railroad, seventeen and a half miles north-west of Huntingdon, laid out by John Cadwallader, of Huntingdon, and called after the city of the same name in England, was incorporated April 14, 1838. It is the site of Mountain seminary, and Baptist, Methodist, Presbyterian, and United Brethren churches. 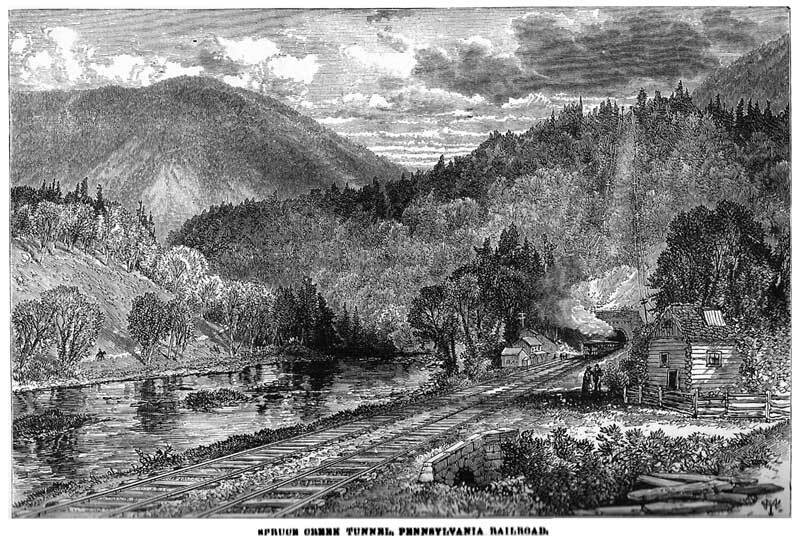 BROAD TOP CITY, near the summit of Broad Top mountain, and near the eastern terminus of the Shoup's Run branch of the Huntingdon and Broad Top railroad, 27.5 miles south-south-west of Huntingdon, was incorporated August 19, 1868, and contains the Mountain house, a well-kept summer resort, a Baptist church, and an Odd Fellows hall. CASSVILLE, in Trough Creek valley, 17.5 miles south of Huntingdon, was incorporated March 3, 1853, and has Lutheran, Methodist Episcopal, and Methodist Protestant churches, two potteries, and was, until recently, the site of the Cassville Soldier's Orphan school. COATMONT, on the Shoup's Run branch of the Huntingdon and Broad Top railroad, twenty-eight miles by rail south-south-west of Huntingdon, was incorporated November 22, 1864. HUNTINGDON is situated on the north bank of the Juniata, at the mouth of Standing Stone creek, two hundred and two and a half miles west of Philadelphia. The Pennsylvania railroad and canal pass through the borough, and it is the northern terminus of the Huntingdon and Broad Top railroad. Although settled as early as 1754, and widely known to traders and the Provincial authorities as "Standing Stone", it was not regularly laid out as a town until 1767, when Rev. Dr. William Smith, the proprietor, at that time and for many years thereafter provost of the University of Pennsylvania, called the town "Huntingdon" in honor of Selina, countess of Huntingdon, in England, a lady of remarkable liberality and piety, who, at the solicitation of Dr. Smith, had made a handsome donation to the funds of the University. During the troublesome times following the defeat of General Braddock, in July, 1755, until the peace with Great Britain in 1783, this place and its vicinity was the scene of many important incidents. 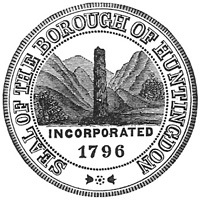 In 1787, it became the county seat, on the erection of Huntingdon county, and on the 29th day of March, 1796, it was incorporated as a borough. Before the completion of the canal this place commanded the principal trade of the county. 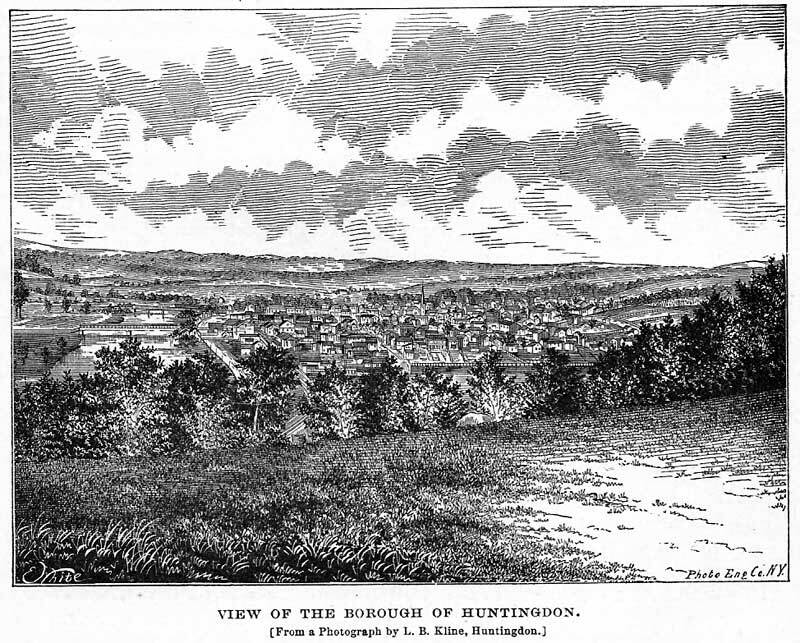 This improvement compelled Huntingdon to share the business, of which it had almost a monopoly, with several smaller towns, and for many years there was no material increase of business or population; but a marked improvement followed the completion of the Pennsylvania, and Huntingdon and Broad Top railroads, until it has become, with a single exception, the most flourishing and populous town in the valley of the Juniata. The error committed by Dr. Smith or making the streets too narrow and omitting alleys, has been avoided in the plans of lots since laid out. The pubic buildings are nearly all, and the residences erected within the last decade are generally, built of brick. The streets are lighted with gas, and the sidewalks in all of the built portions of the town paved with brick. The view from the adjacent hills, taking in the town, the Juniata and Standing Stone creek with their bridges, the railroads, canal, cemetery, and the surrounding scenery, is grand. The cemetery, located on an eminence having an elevation of almost one hundred and fifty feet above the river, the nucleus of which was a small plot of ground donated by the proprietor of the town, and enlarged from time to time, embraces an area of about twelve acres, is used as a place of sepulcher by all religious denominations save one, and as a place of resort during pleasant weather by the entire population. It is owned and controlled by the borough authorities. The borough contains the court house, jail, eleven churches, an academy, incorporated March 19, 1816, three public school buildings, accommodating fourteen schools with eight hundred and ninety-six scholars. The industrial establishments are numerous and varied. The population, according to the census of 1870, was 3,034; it is now (1876) estimated to be 4,100. The local government consists, besides the usual borough officers, of three burgesses and nine councilmen, one-third of whom are chosen annually for a term of three years. These officers constitute the town council, and meet statedly on the first Friday of each month, the senior burgess acting as chief burgess and presiding at the meetings. This town occupies a pretty location. It contains numerous public and private buildings, having the appearance of elegance and comfort, is well and economically governed, has about a fair admixture of the conservative and "young America" elements; few, if any, towns in the interior of the State excel it in wealth, or in the intelligence, hospitality, and social qualities of its people; and with the great natural advantages it possesses, should become, by a judicious combination of the capital, enterprise, and energy of its citizens, one of the most populous and flourishing boroughs of central Pennsylvania. 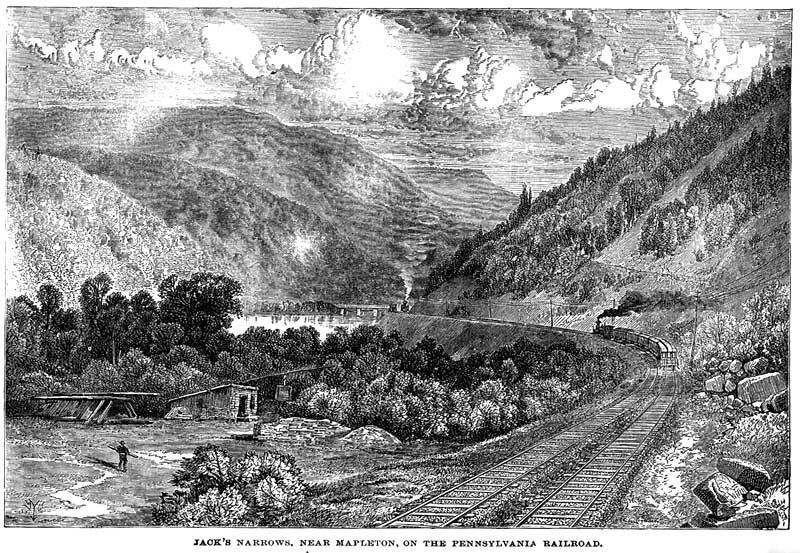 MAPLETON, situation on the Juniata river and Pennsylvania railroad, eight and one-half miles south-east of Huntingdon, was incorporated August 18, 1866. The ground upon which the principal part of this borough stands was owned and occupied by Jacob Hare, a notorious Tory of the Revolution. This, with all his other real estate, was confiscated and sold. MARKLESBURG, on the Bedford road, in Woodcock valley, and near the station of the same name on the Huntingdon and Broad Top railroad, twelve miles south-west of Huntingdon, was incorporated November 19, 1873. MOUNT UNION, on the Pennsylvania canal and railroad, eleven and one-half miles south-east of Huntingdon, was incorporated April 19, 1867. It is the second town in the county in population, and has a Methodist, Presbyterian, and United Brethren churches, Odd Fellows Hall, etc. ORBISONIA, on the Black Log creek and East Broad Top railroad, was incorporated November 23, 1855. The borough limits include the site of old Bedford furnace. Winchester and Rock Hill furnaces were located on the creek, a short distance east of the borough, and the two coke furnaces of the Rock Hill coal and iron company, now producing thirty-five tons of pig metal per day, are on the southern side of the creek. The population of the town has greatly increased since the construction of the railroad. PETERSBURG, on the Pennsylvania railroad, the junction of Shaver's creek with the Juniata river, six and one-half miles north of Huntingdon, was incorporated April 7, 1830. It contains a Lutheran, Methodist, and Presbyterian churches, Juniata forge, a flouring mill, etc. Stages run to Williamsburg and McAlevy's Fort. SHADE GAP, in Dublin township, thirty miles south-east of Huntingdon, was incorporated April 20, 1871. There is in the borough a Methodist and near its limits, a Presbyterian church. SALTILLO, on the East Broad Top railroad, twenty-three miles south of Huntingdon, was incorporated November 10, 1875. SHIRLEYSBURG, on the East Broad Top railroad, twenty miles south-east of Huntingdon, was incorporated April 3, 1837. This borough is located upon the site of the Indian "Aughwick old town" and the Provincial Fort Shirley. From the latter is derived its name. It contains Baptist, Methodist, and Presbyterian churches. THREE SPRINGS, on the East Broad Top railroad, twenty-five miles south of Huntingdon, was incorporated November 10, 1869; has Baptist, Methodist, Episcopal, and United Brethren churches. Besides these boroughs the following villages may be named: BARNET, on Huntingdon and Broad Top railroad, in Carbon township, at the Barnet mines; COFFEE RUN, on the same railroad, in Lincoln Township; DUDLEY, on same railroad, in Carbon township; EAGLE FOUNDRY, in Tod township; ENNISVILLE, in Jackson; FRANKLINVILLE, in Franklin ' FAIRFIELD, in West; GRAFTON, on Huntingdon and Broad Top railroad, in Penn; GRAYSVILLE, in Franklin; MANOR HILL in Barree; MILL CREEK, on Pennsylvania railroad in Brady; McALEVY's FORT, in Jackson; McCONNELLSTOWN, in Walker; NOSSVILLE, in Tell; NEWBURG, in Tod; ROBERTSDALE, on East Broad Top railroad, in Carbon; SHAFFERSVILLE, in Morris; SAULSBURG, in Barree; SPRUCE CREEK, on Pennsylvania railroad, in Franklin and Morris; WATER STREET, in MORRIS; and WARRIOR'S MARK, in the township of the same name. TOWNSHIPS - At the time of the erection of Huntingdon county in 1787, the territory within its present limits was included in six townships, to wit: Barree, Dublin, Hopewell, Shirley, Frankstown, and Huntingdon. Frankstown, much reduced in area, is now one of the townships of Blair county, and in the division of Huntingdon, in 1814, one end was called Porter and the other Henderson. There are now twenty-five townships in the county. Twenty-one were formed since the erection of Huntingdon county, as follow: Franklin, March, 1789, from Tyrone; Springfield, December, 1790, from Shirley; Union, June, 1791, from Hopewell; Morris, August, 1794, from Tyrone; West April, 1796, from Barree; Warriors' Mark, January, 1798, from Franklin; Tell, April, 1810, from Dublin; Porter, November, 1814, from Huntingdon; Henderson, November, 1814, from Huntingdon; Walker, April, 1827, from Porter; Cromwell, January, 1838, from Shirley and Springfield; Tod, April 11, 1838, from Union; Cass, January 21, 1843, from Union; Jackson, January 15, 1845, from Barree; Clay, April 15, 1845, from Springfield; Brady, April 25, 1846, from Henderson; Penn, November 21, 1846, from Hopewell; Oneida, August 20, 1856, from West; Juniata, November 19, 1856 from Walker; Carbon, April 23, 1858, from Tod; Lincoln, August 18, 1866, from Hopewell.